Welcome to 105 Mammoth Drive in Tahoe City! Walk-through and be mesmerized by the immediate scenery and beautiful landscaping that will leave you feeling perched on a mountain-top. Featuring 5 bedrooms, 3.5 bathrooms, and 2-car garage, this spacious and wonderful retreat is just the home you have been looking for. The living room is open and spacious yet cozy and intimate with vaulted ceilings and wooded beams throughout, stoned fireplace, hardwood floors, picturesque windows and direct access to outdoor living on the main deck. A lovely kitchen awaits you with stainless steel appliances, granite counter-tops and more lake views. There is a master suite on the main level and second master suite in the lower level with deck access. Three additional bedrooms and large family/bonus room complete the downstairs. This Dollar Point home is located in one of North Shore’s most desirable neighborhoods with exceptional HOA amenities from pool, tennis court, private beach, pier and buoy. A must see with a large lawn and enclosed back yard for entertaining with friends and family. 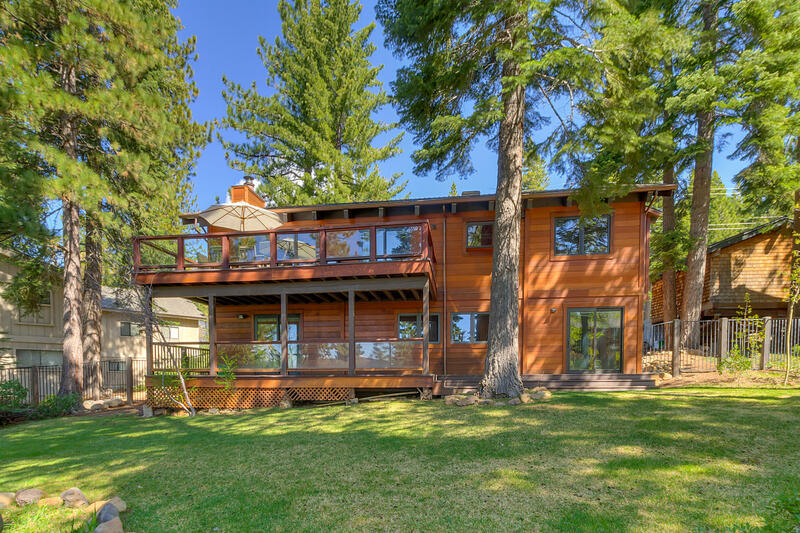 Enjoy the essence of Lake Tahoe and never miss a sunrise or sunset with lake views from the two back decks.